Euan Louis Mylne was the sixth of seven sons born to Bishop Louis George Mylne, who, having served as Bishop of Bombay, returned to the UK and eventually took up a post as Rector of Alvechurch. Remarkably, all seven boys – Edward (known as Graham), Alan, Ronald, Kenneth, Athol, Euan and Angus – served in the First World War, and two never returned. Graham died from wounds on June 12, 1915, and Euan on September 15, 1916. Having left Uppingham School in December 1915, Euan received a commission in the Irish Guards as 2nd Lieutenant in January 1916. He was soon promoted to Lieutenant, serving with the Expeditionary Force in France and Flanders. 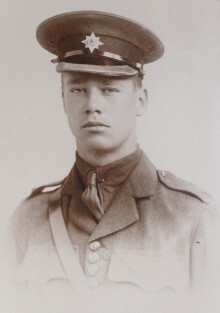 On June 16 – his 19th birthday – Euan agreed to go to the front immediately instead of completing a machine-gun course. The Battle of the Somme was to begin on July 1. Euan’s former prep school, Packwood-Haugh, records the following on its Roll of Honour: “He died on the battlefield on September 15 from wounds received at Le Beoufs during the Battle of the Somme. He was working machine guns to check a heavy counter-attack from the enemy. He was struck by a sniper’s bullet, which pierced his right hand and lodged in his flank. Euan’s family did not learn the news of his death until around a month later, aware only that he was wounded and missing until a private source told them they must not think of him as possibly alive. An article about Euan in the Bromsgrove, Droitwich & Redditch Weekly Messenger in March 1917 states that his death had only just been officially announced, but confirms that he was posthumously awarded the Military Cross for conspicuous gallantry in action. It also offers further detail about Euan’s death: “The trench in which he was unavoidably left, when a counter-attack at tremendous odds retook it late in the evening, was visited next day by a wounded soldier dragging himself back to the British lines. “He found it “No Man’s Land” for the time being, and spent some time in it by the side of his gallant young officer’s body. Announcing the Military Cross, The London Gazette of November 14, 1916 said: “in the final stages of the attack, when different units were mixed up, he showed great coolness in reorganising the men. Euan is buried in the Guards’ Cemetery, Les Beoufs, France. The inscription on his grave reads: IT IS WELL WITH THE LAD. The middle Mylne brother, Kenneth, who also served in France but survived the war, wrote letters almost daily to his mother, and these have been transcribed by his granddaughter into a book called My Dearest Mother. As well as offering a detailed insight into life at the front, it contains a few family photographs including the ones featured here. 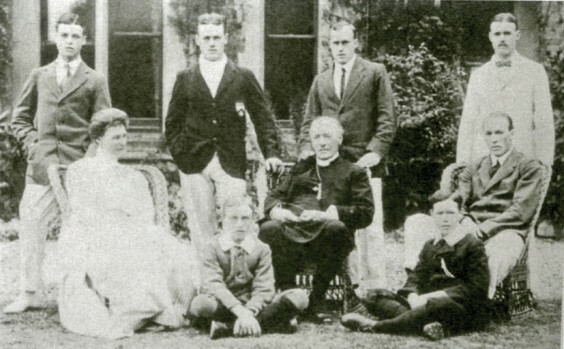 Below: Alvechurch, 1911 – the last time the Mylne family were all together. From left: Athol, Amy, Kenneth, Angus, Louis, Alan, Euan, Graham, Ronald.